It’s HERE, happy daylight savings everyone, we hope you parents with small children will soon be sleeping past 5:30am now that the clocks have SPRANG FORWARD ONE HOUR! Most of us know now that daylight savings coincides with a push to change your smoke detector batteries but did you also know that you should clean your smoke detector? How? Let us show you! Firstly you need to remove the cover of your smoke detector, this will vary depending on the model you have but it most likely requires a small twist. Instructions are often printed on the outside of the unit either pressed into the plastic moulding or via a sticker. To do this you should be as close as possible to the smoke detector and ensure you are standing on a stable surface designed for supporting the weight of an adult at height such as a step ladder. Remove the old 9v back up battery by peeling the connector from the battery head, pulling may cause the wires in the connector to become detached. In Australia most smoke detectors will require a 9v battery as their back up but not all units have these, especially if your property was built pre 1999 and has not been sold since. If you are unsure, many companies across Australia can attend your premises to replace the smoke detector battery and clean the appliance, this way you can be sure of the type of you unit you have and what maintenance it requires, searching online is the best way to find a company near you. The other alternative is to look for a serial number stamped into the moulding and search online for maintenance instructions. If you are unable to reach your unit with a vacuum, the next best method is to blow with your mouth (or a hairdryer) and use a clean cloth to wipe away any dust that is dislodged from the unit. 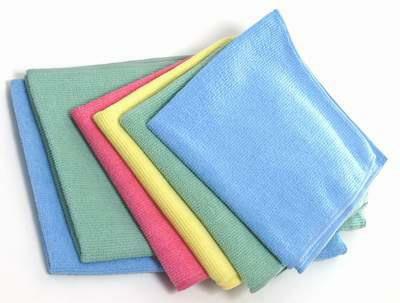 Any type of cloth will do as long as it is DRY and CLEAN. We do not recommend using dusters as they often push pollutants further into the unit causing more problems than they solve, magic wand, feather duster, swirling microfibre – it doesn’t matter what brand you use, a duster is not recommended for this purpose. Most units will have a small button located on the ‘face’ of the unit which is used to test the alarm, press it once now to ensure the battery has been correctly installed and the unit is now working. 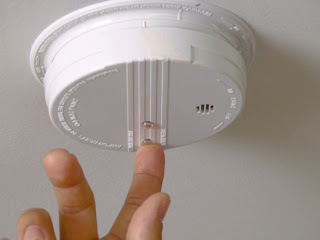 Should your smoke detector fail to respond, remove the cover and check that the battery has been properly connected, replace the cover and try again. Occasionally wires which connect the unit to the battery can become detached when the battery is changed, if your unit fails to respond twice you may need to call an electrician. Should your smoke detector start beeping frantically as soon as the new battery is connected, it is likely that a piece pollutant has been pushed into the detection area and is setting off the alarm. Remove the battery, clean the unit again and then try to reconnect the battery. This may need to be done two or three times until the dust or pollutant is dislodged. 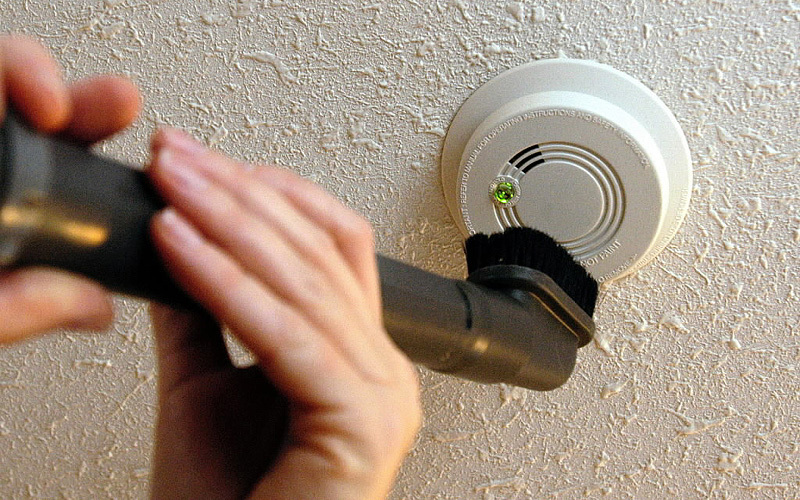 Repeat for every smoke detector in the home, not just the one near the kitchen. Don’t forget to ensure smoke detectors are installed outside of bedroom entrances, even if you are renting you can purchase a battery only alarm from bunnings which can be mounted with sticky foam for approximately $10 each or placed on top of a high piece of furniture such as a bookcase. 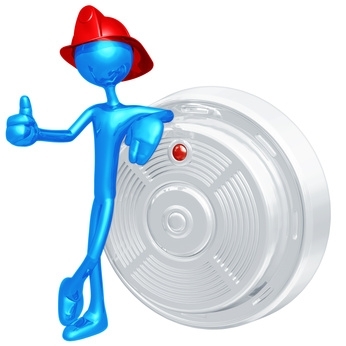 And lastly – don’t forget to test every smoke detector ONCE A MONTH, it only takes 2 seconds to press the little button and make sure the unit beeps back at you, set a reminder on your phone to let you know when a month has passed!